Grounded: Mom, My Siblings Drive Me Crazy! Welcome to Day #10 of the Grounded Series! Having 3 brothers, ranging in age from 3-10, and a 5 month sister is rough. Really rough. Continuous amounts of stress pour on me like heavy rain. Crying. A LOT of crying. 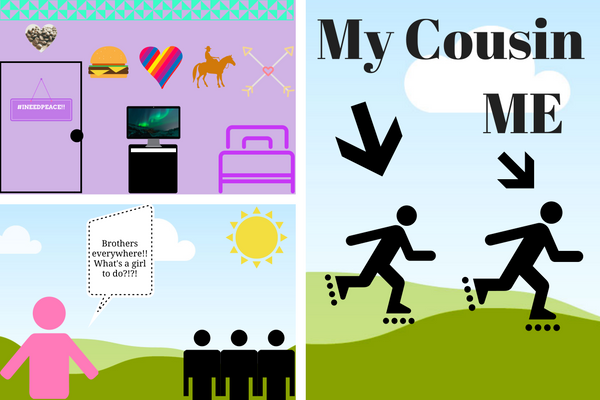 Yelling, fighting, slamming doors, (and that’s only 5 of the, wait, 17 things that I do when brothers antagonize). Teasing me about my looks, my friends, my actions. Let’s see, what else…….oh yes, my “favorite” one, “You Roller-Blade funny, when you try to stop….you just run into the grass.” Well my dear brothers, maybe it is because……..the brake is rubbed off!!! Geez. P.S. I really do not roller-blade funny. 😉 Maybe they heard that lady that drove by when me and my cousin were roller-blading and yelled at me and said: “Ya know, if you stand up straight, you’d go much faster.” Really. I was bending over just to go faster! Romans 12:9-10 “Let love be genuine. Abhor what is evil; hold fast to what is good. Love one another with brotherly affection” (ESV). Okay, at this point I think we should name this “Understanding the verse” time. Let’s call it, Observation time. Alright, time for “Observation Time“. “Let love be genuine……” What?? Is that a word in the martian vocabulary or something?? Thank goodness no. Genuine things are true or authentic. When you’re talking about people, being genuine has to do with being sincere. Love should be genuine or sincere. Or we should be genuine in love. Not in hate. We shouldn’t hate. Big X over the word hate. God calls us to love. And our love is to be genuine. And then here’s the next one: “Abhor what is evil; hold fast what is good…..” Abhor?? I know what all you fellow tweens are thinking……. “What does that mean? Another martian word?!?! Is she trying to poison our minds?? Woah! !” Trust me, I do not mean to make your brain explode. If you abhor something, it gives you a feeling of complete hatred. We were just talking about hate and hatred. Wow. How funny!! 😀 But, this kind of hate is good, it says we should abhor or hate evil. That is good. It also says to hold fast to what is good. That also means to keep what is good. Next, “……Love one another with brotherly affection.” Brotherly affection. Great. I have brothers so I should love them by shooting them with toy Nerf guns?? Cuz that’s what they do to me. Affection is the positive feeling you may have or express for other people or things. 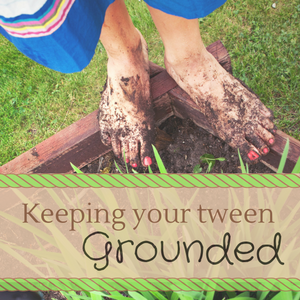 Grounded: Mom, Chores Drive Me Crazy! This is so sweet. I love Brooklyn’s “voice” and as a Mom of a couple tweens & a teen, I totally get what she’s saying about the NERF GUNS. 🙂 Love this post! Sharing it with my kids! Thank you Angela- proud Mama for sure! Oh, my goodness! This sounds so much like my 13 year old! I think they would be able to relate to each other. Lindsay has 11 and 7 year old brothers and a 3 year old sister. It’s a beautiful thing to see their honesty AND their search for answers in scripture. Love this age, as crazy emotional as it is at times.